Although there is obviously a considerable area of overlap, social science research and journalism have distinct purposes and perform different societal functions. The primary purpose of research, at least at universities, is to discover knowledge both for its own sake and for the betterment of human kind, not to improve the practice of democracy by supplying the public with information to facilitate the “voting of wise decisions.” While some of this knowledge will facilitate public as well as private decisionmaking, much will not. And while academic researchers occasionally engage in research with the specific purpose of producing information to persuade others on matters of public concern, such ideological advocacy is not the primary ethos of academic research and, indeed, can be in tension with the primary academic goal of discovering truth regardless of its political or social implication. In contrast, a primary purpose of journalism is to inform people about matters of public concern and to act as a “watchdog” against governmental abuse and official malfeasance. Similarly, the function of the editorial side of journalism is precisely to influence public opinion. This essential difference between social science research and journalism is reflected in the publications through which these two professions communicate with the public—scholarly journals and academic books versus newspapers and magazines. Scholarly publications are usually aimed at a narrow, specialized audience and address people in their professional capacity; journalistic media, in contrast, are typically aimed at a more general audience, often addressing people in their capacity as citizens (as well as consumers). Moreover, not only do general circulation newspapers and magazines usually contain an editorial page in which the publisher and editors try to persuade people on matters of public concern, these publications also often have an opinion page in which members of the public are invited to do the same. In contrast, while some scholarly publications publish editorials and even more commonly letters from scholars in response to an article or some academic issue, these publications do not generally solicit the views of the general public. Accordingly, although scholarly journals and books, on the one hand, and newspapers and magazines, on the other, both form part of the “structural skeleton that is necessary for public discourse to serve the constitutional value of democracy,” it is the newspaper and magazines that form the “backbone” of this structure. Scholarly publications, in contrast, contribute less central support for the structure (a “shin bone” perhaps, to continue Post’s orthopedic metaphor). The Court might therefore take a more refined approach to a law that imposed IRB regulations directly upon social scientists at research institutions than it would to similar restrictions imposed on journalists. Borrowing a page from its defamation jurisprudence, the Court might hold that to the extent the interviews related to matters of public concern such as attitudes towards homosexuality, abortion, or the war in Iraq, the regulations could not be applied. With respect to interviews on subjects not of public concern, such as the language used by waiters and waitresses or whether people can match dogs to their owners, the Court might well apply a lesser degree of scrutiny. This distinction would reflect the more important role played by the press in our democracy. It would also take account of the related fact that unlike the typical journalistic interview or survey, many social science interviews and surveys will not contribute to democratic self-governance. It is true that avoiding an overly-refined doctrine that is difficult to administer argues for deeming all interviewing techniques directed towards producing public information a unified medium warranting the same high level of First Amendment protection. 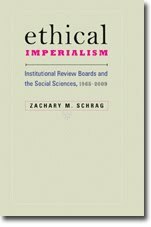 Still, the lesser contribution that social science interviews generally make to the “constitutional value of democracy” suggests that regulations that burden these communications should trigger something less than the exacting scrutiny that would be applied if IRB regulations were applied to journalists’ communication with their sources. The idea that the "typical journalistic interview or survey" involves great questions of war and peace and commerce and culture, while the typical social-science interview or survey involves dog owners, is, I suppose, a testable hypothesis, though not one that Weinstein tests by sampling news stories and journal articles. Absent such evidence, it is an anti-intellectual slur. Weinstein concedes that "funding issues aside, it is possible that the Court would find IRB regulations unconstitutional as applied to research using only traditional interview techniques," especially if they were imposed on survey or interview research "on matters of public concern." His tolerance for IRBs must therefore rest on his belief that such research is so rare that it's OK if it is caught up in a system designed to protect human subjects from useless research. There is the statesmanship of thought and there is the statesmanship of action. The student of political science must furnish the first, out of his full store of truth, discovered by patient inquiry, dispassionate exposition, fearless analysis, and frank inference. He must spread a dragnet for all the facts, and must then look upon them steadily and look upon them whole. It is only thus that he can enrich the thinking and clarify the vision of the statesman of action, who has no time for patient inquiry, who must be found in his facts before he can apply them in law and policy, who must have the stuff of truth for his conscience and his resolution to rely on. . . The man who has the time, the discrimination, and the sagacity to collect and comprehend the principal facts and the man who must act upon them must draw near to one another and feel that they are engaged in a common enterprise. The student must look upon his studies more like a human being and a man of action, and the man of action must approach his conclusions more like a student. Another relevant question, it seems to me, is how many people read the newspaper every day v. how many attend college, where they learn things that are the result of social science research and that may shape their later political actions. Research results don't just sit in journals; the good ones get transmitted in other ways, not least through journalism. How else would the NYT Science section fill up? Or the Washington Post Outlook section?